PATRICK MC.CARVILLE relates the story of the founding of one of Australia’s most colourful clubs. The friendliest golf club I know in Australia lies along the shores of Little Bay, about 13 km south of Sydney. The course is a testing par 72, which over the past 20 years has hosted the Australian P.G.A. and the N.S.W. Open. But to my mind the most important event held at St. Michael’s is its Thursday Open Day, which has arguably become the most successful mid-week competition in Sydney. With fields of up to 250 players coming from as far away as Newcastle and Wollongong to compete in an atmosphere of good sportsmanship that would be hard to equal anywhere in Australia. St. Michael’s Golf Club might never have come into being if Ted O’Keeffe had not caught the golf bug 65 years ago. 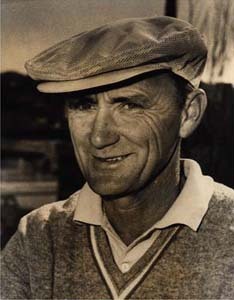 Mr O’ Keeffe, though not a young man, took the game seriously and had regular lessons from Mr Will Corry, a leading professional, whose name is now immortalized at the 15th hole- Corry’s Creek. Ted O’ Keeffe had his first lessons on the Victoria Park Racecourse, Rosebery, where a nine-hole golf course had just been opened for play. So enthusiastic did he become that he got together a number of professionals for a weekday game at Victoria Park. He provided a set of gold cuff links for the winning amateur and a similar trophy for the professionals. Ray Vaughan thought Eyre’s suggestion a good one and sought the assistance of the Right Reverend Monsignor James Meany, the parish priest of Drummoyne, with whom he had been closely associated in the organization of the International Eucharistic Congress held in Sydney in 1928. Father Meany gave his enthusiastic support. He was a golfer of no mean calibre – a regular player at Concord Golf Club, on a low handicap. A preliminary meeting was held and it was decided to draw up a constitution and submit it to a subsequent meeting. On December 8, 1932 the constitution was approved and thus came into being “The Niblick Club”. Father Meany was elected President and became Honorary Secretary with Mr Clem R B Glancey Captain and Handicapper. The first event was held at Victoria Park on the first Sunday in February 1933, and more than 20 players took part. Membership increased steadily and as Victoria Park become better known, play became difficult. It was then decided to seek an area of land on which to provide a course the club could control. 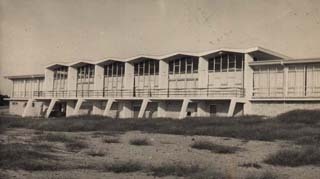 Clearing was commenced early in July 1937. The area was heavily scrubbed and there being no bulldozers in those days the scrub was dragged out with tractors and wire ropes. After rotary hoeing, harrowing and raking, the fairways were equipped with couch runners and seeded. 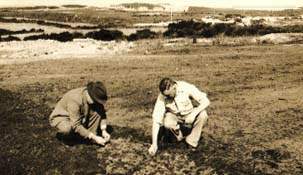 Green sites were prepared and seeded, a reticulation system installed and nine holes were opened for play on Sunday, June 5, 1938. The track was pretty rough, but its use so early brought in some much needed revenue. The remaining nine holes were in play a year later. On Founders Day each year the Catholic members of the Club attend mass and offer Holy Communion for the repose of the souls of deceased members. The annual mass originated in 1934, when the Niblick Club members started what became an annual visit to St. Mark’s, Drummoyne; Father Meany’s Parish Church. There the order was no collection, no sermon and breakfast provided by Father Meany. Today the mass is celebrated in the clubhouse, and the club provides breakfast. When Japan came into World War II the army took over the property and that of NSW Golf Club. 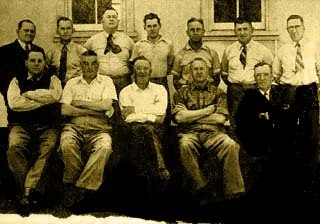 The military occupation lasted from March 16, 1942, until January 31, 1946, and the Club was kept alive during the period by holding fortnightly games at Eastlake Golf Club. Since then St. Michael’ s has grown into one of the best clubs around Sydney. In 1963 the new clubhouse was built and it is recognized as one of the most comfortable 19th holes in NSW. Father Meany was St. Michael’s first President and when he passed away Ray Vaughan took over until 1958. Over the years St. Michael’s has contributed more than its share of great players to the golfing arena, including Harry Berwick, Brian Grandemange, Kevin Donohoe, Jeff Wagner and George Bell. The Great Harry Berwick, considered by some to be the best amateur to have represented St. Michael’s. St. Michael’s reached its 50th Birthday, and quite appropriately, that milestone coincided with the Bicentenary in 1988. Since its birth as a recognized golf club, St Michael’s has been privileged to have had the services of some outstanding professionals. Bobby Barr was the club’s first appointed professional and he served the club with distinction for six years after the war, during which time he left his own indelible mark on the club’s history. Following in the footsteps of Barry came Dan Cullen, who was to spend over 20 years at St. Michael’s before deciding to call it quits in 1975. Dan was and is a household name in golfing circles, and it is hard to find a golfer in Sydney who does not know Dan personally, or at least know of him. Dan’ s reputation as a club pro and also as a capable player was well-earned. In fact he capped a fine career when at an age when most golfers have hung up their clubs, he went to Scotland and became the eldest qualifier ever for the British Open Championship at the rugged Turnberry Links.